Our book about Jutoh is free (except on Amazon, where it available at a nominal price for the convenience of synchronising with your devices). You are welcome to share it with your friends. It's available in HTML, Epub, Mobipocket, and PDF formats. If you want a quick look, check out the online HTML version. The book of around 200 pages contains comprehensive advice on using Jutoh, troubleshooting your ebooks, what tools to use with Jutoh, tips on marketing your books, and much more. 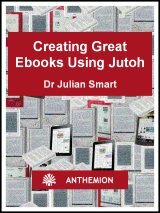 Creating Great Ebooks Using Jutoh was written entirely within Jutoh - so it should also give you an idea of what's possible, and you can check out the original Jutoh project file as an example. Click on one of the links below to view or download the book in your preferred format. Exclusive to Amazon: get started with publishing on Amazon with this guide from the makers of Jutoh. Learn how to import your existing book or create a new one; get to grips with Jutoh's powerful features, including creating a table of contents and alphabetical index; and learn how to edit, format and preview your Kindle book for the best results on Amazon. Includes information on including a cover, submitting your book to Amazon, and marketing your book, with a chapter 'Formatting Like a Pro' to help unravel the mysteries of styles, spacing, fonts and more. Kindle Unlimited subscribers can read this book for free. This is an online version of the Knowledge Base which is included within Jutoh and can be searched using the Search Help field in the Jutoh toolbar. A Guide to Jutoh Plus is the documentation for the scripting facilities in Jutoh Plus, an enhanced edition for publishers processing a lot of books. You might also want to read Jon Donahue's excellent free book on using Jutoh to create Kindle books. This concise guide is just the ticket if you're itching to get going quickly. Take a look at Julian Smart's Jutoh blog for some tips and tricks. If you speak German, you can read Rudolf Ruf's Jeder kann ein E-Book erstellen. If you speak Italian, you can read Come creare e-book con Jutoh by Antonio Mercurio. For a Swedish book about Jutoh, see Skapa en Ebok med Jutoh by Tina Back.